Home / science / spirituality / Artist Uses Brainwaves To Manipulate Water – Incredible Display Of The Power Of Human Emotion! 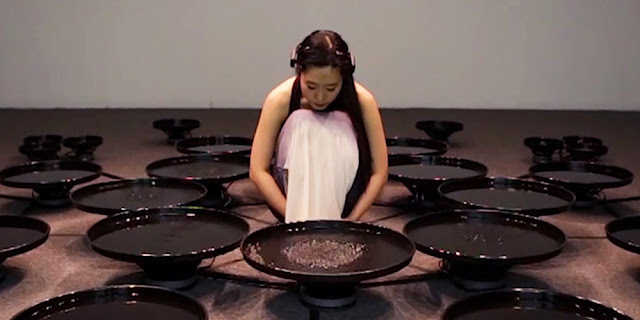 Artist Uses Brainwaves To Manipulate Water – Incredible Display Of The Power Of Human Emotion! Artist Lisa Park has come up with an interesting new art form. Her art performance is called Eunoia. It derives from the Greek word “eu” (well) + “nous” (mind) meaning “beautiful thinking”. She uses 48 pools of water, inspired by the 48 emotions, which react to emotional brainwaves transmitted from her body, and read by sensors. Electroencephalography (EEG) is a brainwave detecting sensor. It measures frequencies of her brain activity (Alpha, Beta, Delta, Gamma, Theta) relating to her state of consciousness while wearing it. The data collected from EEG is translated in realtime to modulate vibrations of sound with using software programs. EEG sends the information of her brain activity to Processing, which is linked with Max/MSP to receive data and generate sound from Reaktor. Watch Lisa Park as she puts her inner struggles on display in a beautiful geometrical water display! You can find more about Lisa Park here.